As a courtesy to our customers, we’re giving a heads up to all VW Touareg owners with 2004 – 2007 gasoline powered SUV’s! 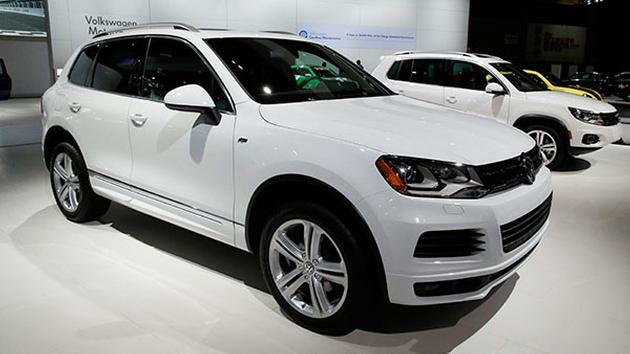 Volkswagen is recalling nearly 74,000 SUVs in the U.S. because a fuel pump flange can develop cracks and leak gasoline. 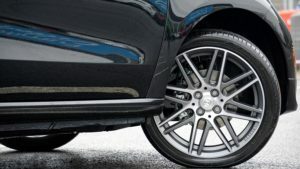 It’s part of a larger recall announced in July by the National Highway Traffic Safety Administration involving flanges made by parts supplier Continental that could affect millions of vehicles. The agency is investigating which vehicles are affected. VW says the safety agency found consumer complaints about the problem. Aging oxidation can weaken the flanges and cause small cracks. Those can leak fuel and cause fires, although documents don’t mention any. You must take your vehicle to a authorized VW Dealer who will inspect the flanges and replace them if necessary. Those vehicles without cracks will get a protective cover. Either way, there are no out of pocket costs for you. Remember too that although you must take your car to the dealer for any recalls, you don’t have to have your vehicle’s regular maintenance service schedule work done at a dealership. We’ve got that covered for you. Call us to schedule those services. 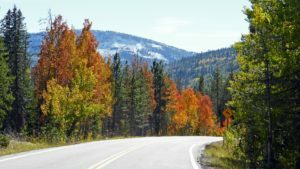 Not many people would argue that today’s cars, light trucks, and sport-utility vehicles are high-tech marvels with digital dashboards, oxygen sensors, electronic computers, unibody construction, and more. They run better, longer, and more efficiently than models of years past. But when it comes to repairs, some things stay the same. 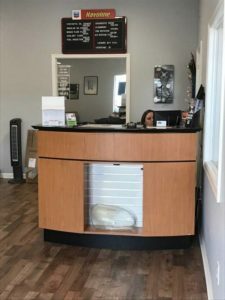 whatever type of repair facility you patronize whether it’s a dealership, service station, independent garage, specialty shop, or a national franchise–good communications between you and your automotive service provider is vital to getting the results you want from your auto repair specialist. Before taking your vehicle in for repairs or service. think about what you need to make the technician working on your car to understand and prepare to report your car’s problems. Today’s technician must understand thousands of pages of technical text. Fortunately, your well thought out report of what’s bringing you in for today’s auto repair check shouldn’t be that technical but offering a good overview of the problem will certainly help. Get to know your car. Read the owner’s manual to learn about the vehicle’s systems and components. Note when the problem occurs. Are you starting the car? Idling? Turning? Stopping? Is the problem constant or periodic? Does the issue present when the vehicle is cold or after the engine has warmed up? Is the problem present driving at all speeds? Only under acceleration? During braking? When shifting? Stay involved… Ask questions. Ask as many questions as you need. Do not be embarrassed to request lay definitions. We hope this list gives you a better understanding of how you can better communicate what your service technician. An automobile is an incredibly complicated piece of machinery. Today, there are thousands of models out there and with each one of those models requires different parts and experience to service properly. Even if you have some car repair experience you can often times find yourself confused when you have a car problem. 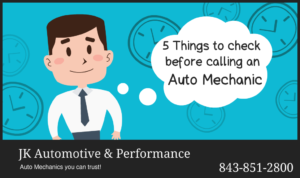 However, when your car won’t start, check these 5 things before you call the auto mechanic. These common auto problems may require nothing more than minor maintenance. The alternator is what powers your vehicle’s engine. Thus, if the alternator stops working, so does your car. But you should be able to determine when your alternator is going ‘bad’. Look for an alternator bulb that comes on when the engine starts. If that light doesn’t come on, you may need to replace the alternator altogether. Of course, check to make sure the light is working also. It may not be your alternator that’s the problem. It may be that the alternator belt has cracks or glazing from repeatedly being heated and cooled. This can cause looseness in the belt, which causes low output on the part of the alternator and that prevents the battery from fully charging. Big Changes for JK Automotive in 2015! 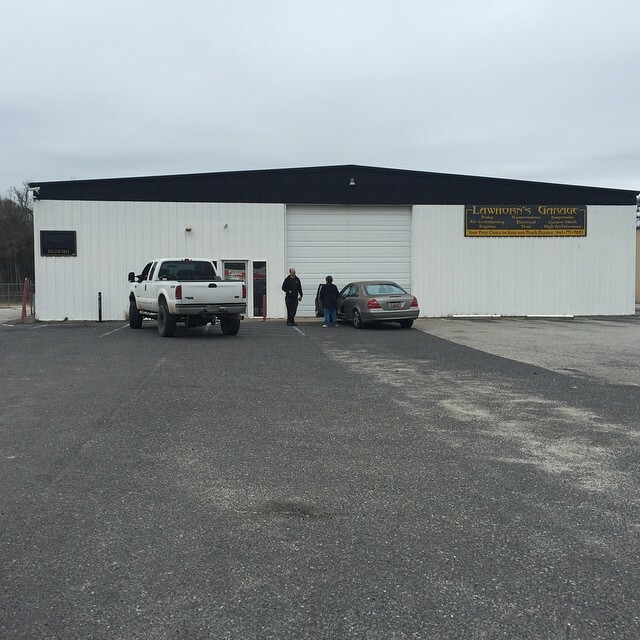 A new year… a new shop… a new location for JK Automotive beginning February 2, 2015! 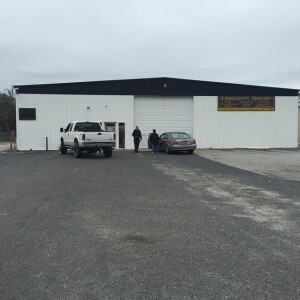 We won’t be leaving Summerville or moving very far, but we will be packing up our auto repair shop and moving it just down the road to a new, larger, and more convenient location over the next few weeks. Formally the home of Lawhorn’s, and located about a half of a mile away from our current location, the new shop is located at 1626 N. Main Street. We’ll be near the corner of the new intersection of Brighton Parkway and 17A/ Main Street in Summerville right across from Bi-Lo. The new expanded shop will enable us to grow! Of course we’ll continue to provide you, our current valued customers, with the same quality services we’ve been offering you over the past few years, but the size of this shop will provide us the ability to offer you more services and opportunities for us to attract new customers going forward. We’ll be more visible, easier to see from the road, and be able to continue to grow our business in 2015. We hope you’re going to like the changes as much as we are and continue to visit us for all your car care needs. We thank you for your business, strive to work even harder to offer you the best auto repair in Summerville and look forward to seeing you at the new shop! 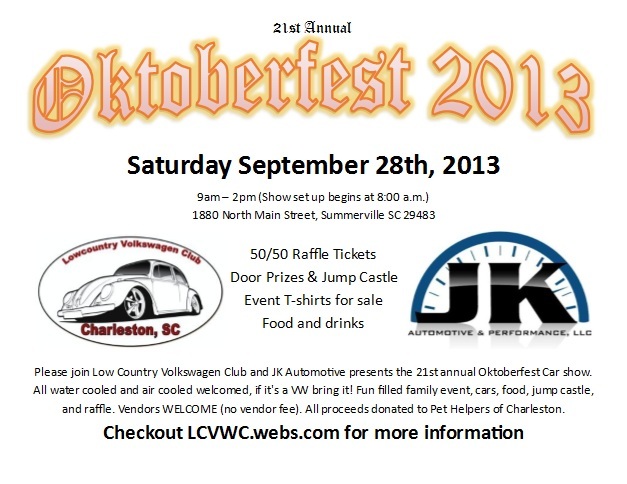 For the second year in a row, JK Automotive will be a sponsor of the 2013 Southern Worthersee. The Wörthersee, held in Reifnitz, Austria is the largest gathering of VAG enthusiasts in the world. For more than two decades, this charming lakeside village has hosted millions of enthusiasts, who come to appreciate the most innovative and trendsetting VWs and Audis in Europe. Wörthersee, as this event is most commonly known, derives its name from the beautiful lake that dominates this popular vacation area. “Southern Worthersee”, is the biggest Volkswagen VW and Audi car show on the east coast. Southern Worthersee’s inspiration for the show is to bring together cars and fans of these beloved marques in a truly authentic European atmosphere and it has been successfully doing that since the first show in 2007. 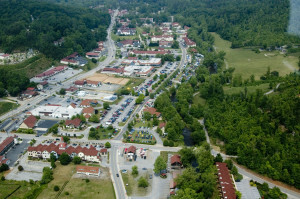 Located in Helen, GA, the three day car show is May 17th through May 19th. You can find the schedule for the show below and for more information on where to stay and what to expect, and plenty of photos of previous shows visit the Southern Worthersee website by clicking here. If you’re coming out, be sure to stop by our booth and say hi. 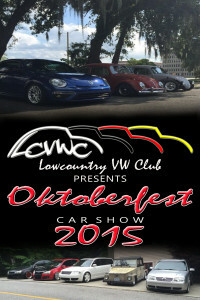 Free Admission to all Event Activities ! 5:00pm-10:00pm Main gates open for Pre-Registered vehicles. 8:00am-10:00 am Open registration and parking for Edelweiss display areas. right to consolidate pick ups due to time and traffic. 1:30pm-2:45 pm Live performance by Detroit Mutant Radio on the Main Stage. 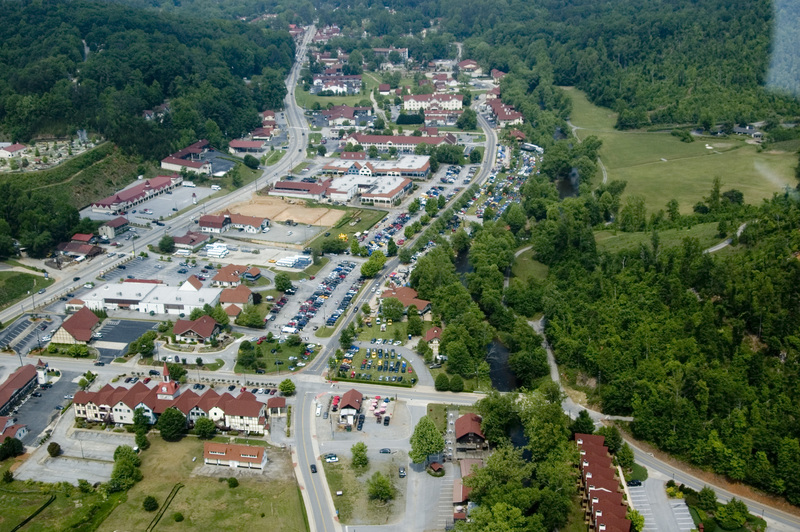 4:00pm-5:00 pm Exit property. Clean up begins. Volunteers are welcomed! be 18 to enter, 21 to drink. No one under 21 admitted after 10:00pm. 9:00am-10:00 am SOWO Top 50 Winners reassemble at Main Event area. 12:00pm-1:00 pm People’s Choice balloting and “Best Of” selections. 1:00pm-2:00 pm Awards and Trophy presentation. 3:00pm-4:00 pm Exit property, clean up begins. Make your reservations for next year!